(a) Apply a light layer of lithium soap base glycol grease to the entire circumference of 2 new brake master cylinder reservoir grommets. (b) Install the 2 brake master cylinder reservoir grommets to the brake master cylinder reservoir assembly. (c) Install the brake master cylinder reservoir assembly to the master cylinder body. (d) Mount the brake master cylinder sub-assembly in a vise. Place aluminum plates on the vise to prevent damage to the brake master cylinder sub-assembly. 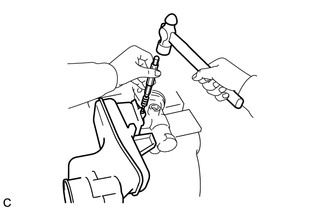 (e) Using a pin punch and a hammer, tap in the straight pin.